Our non-smoking, two bedroom, two bathroom condo is conveniently located just off the Mountain Road at Mountainside Resort. It is about two miles from town and about four miles from the mountain. It is a short walk to the mountain shuttle. (It is also a short walk to the fantastic sports bar across the street!) Mountainside resort has a large indoor pool, hot tub, and game room that guests are welcome to use. They also have tennis, basketball and volleyball courts, along with outdoor grills. We are relatively new owners of the condo and have made it a priority to make our unit as clean and comfortable as possible for our renters. 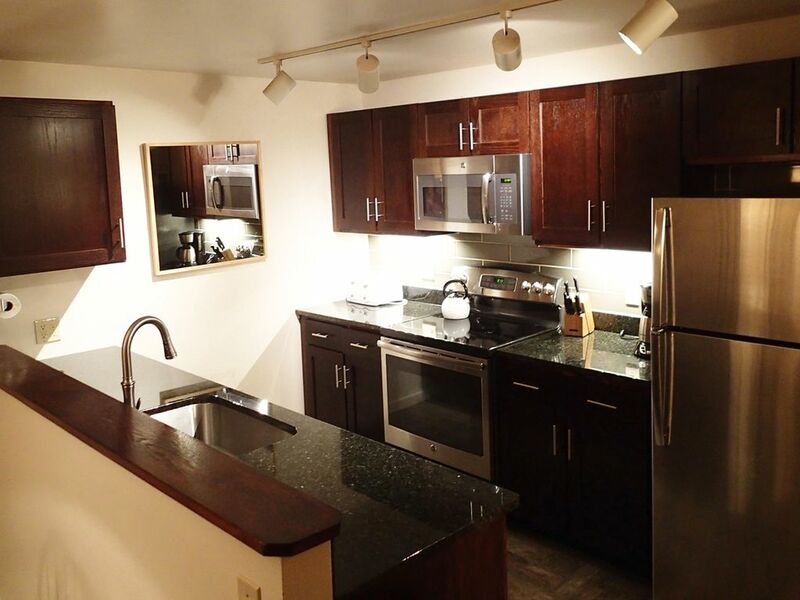 There is wireless internet access in the unit that you are welcome to use. And the unit has been freshly painted and furniture has been replaced. We have also installed a home theater system, and provided many books and games (in case mother nature does not cooperate). Our large deck is the perfect place for outdoor dinners, morning coffee, and lounging in the afternoon. Stowe, Vermont is a beautiful place to visit any time of the year. We believe Stowe is the best place to ski and snowboard in Vermont - we never tire of spending an day on the mountain. There is also great cross-country skiing and snowmobiling. In the summer, the Stowe recreation path is perfect for biking and rollerblading. There is also fantastic hiking, mountain biking, golfing, fishing, and antiquing in the area as well. In the fall, Stowe is one of the best places in the country for leaf peepers to witness the beautiful fall foliage. Restaurants in the area are superb as well. We make it a priority to try out as many restaurants in the area as possible - and we have not been disappointed! We love our mountain get-away and hope you will too! We are a family of 5 based in St. Louis, MO but used to live in Boston which is why we own our places in Stowe. We come up to Stowe frequently to make improvements to our properties and enjoy a bit of New England charm. Our condo has a nice open floor plan with a central fireplace which keeps everyone connected and able to hang out... even if you are in the kitchen. Mountainside Resort is great for families with the pool, hot tub and rec center. It's also really close to the rec path. Mountainside just added a gym with all new equipment. The washer/dryer is in the pool/rec building - one building away from ours. It takes quarters.